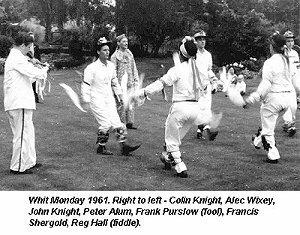 Francis Shergold resigned as Squire of the Bampton Morris in November 1995, after an astonishing 60 years as dancer with the side - 45 of those as Squire. 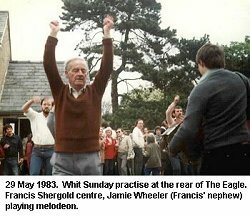 He was awarded the Gold Medal of the EFDSS in 1996 (see our report), as had the former Squire, 'Jinky' Wells, some 38 years before. With the rebirth of MT, it seemed an appropriate time to commission an article on Francis, as he assumed the mantle of Honorary President of the side. At 79, he continues to participate in all the side's activities, including the dancing at times, and we have every expectation that he will continue to do so throughout the coming seasons. Keith Chandler's article follows Francis' career through to the 1980s, and he has suggested that I might like to add a post-script to continue the story, from a personal perspective, through to the present day. I hope that this will be added to the piece in the not too distant future. 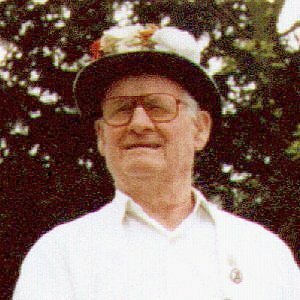 Although I continue to interview and record material on the Bampton morris tradition, the majority of what follows was collected directly from Francis, his brother Roy, sister Ruth, and mother Louise in 1980, during a heady period when I effectively lived in Bampton and was recording information on almost a daily basis. In addition to more formal interviews, generally in the homes of informants ( 8 and 10 are examples here), much of what I collected was gleaned in casual (though often directed and steered) conversation, often in the Shergold side's headquarters of the time, The Eagle pub in Church View. In fact, I practically lived in the cottage two doors from that pub for a year. As a result, even where portions of the following paragraphs do not appear in quotes they are generally close paraphrases, written down as soon as possible after they occurred, so that this remains essentially Francis' own story told in his own words (in italics), augmented by those of his immediate family. 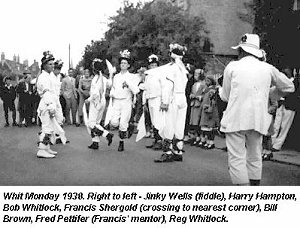 By the date of Francis' first involvement with the morris dancers, the recent problems caused by personality conflicts - which resulted in two distinct morris dance sides appearing for a number of years from 1927 on - had been resolved. 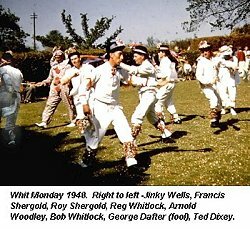 12 and 13 During the 1930s there certainly were Whit Mondays when a second team made an appearance, but it was that led by fiddler William Nathan 'Jinky' Wells (1868-1953) who annually kept the tradition going without fail. As to pre-Whitsuntide practices, 'About a month before they'd start - perhaps once a week. They never used to bother much in them days. They all knew it ... We never used to practise much until we went to the Albert Hall the first time (i.e. in 1967) ... You could always tell me - I was always on the wrong foot. Well, Jinky couldn't see to correct you.' 10 Then, as now, the tradition was well able to accommodate stylistic divergences. 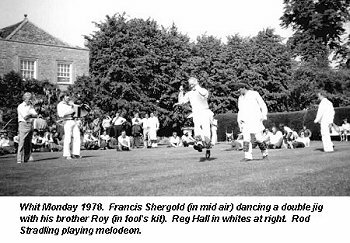 Some time after the war it was agreed that Francis would be the leader (Squire) and Arnold Woodley would teach the dances. In 1950 George Hunt and another newcomer (whose name is no longer recalled) joined the team. At the practice behind the Lamb on Whit Sunday Arnold said to Francis that these two were not good enough to go out the following day. Arnold said, "What if someone should ask who had taught them?" Francis replied, "What's the problem, Arnold? Tell them I did." Arnold felt so strongly over the quality of the newcomers' dancing that he wouldn't turn out on the Monday. 5 By the following year he had raised his own team, consisting mainly of young boys, so that throughout the 1950s there were again two sides touring the town at Whitsun. In 1980 Francis was able to comment that during the recent past - even as recently as five or six years previously - 'I used to feel embarrassed to walk down the street in Bampton dressed in whites. I don't know if there was a lot of new people came into the village and they didn't know what the morris was all about or what. If there were three or four of you that was all right, but if I was on my own I felt really embarrassed. Nowadays people will stop you and say, "Where are you going today?" There seems to be a lot more interest in the village.' Eighteen years on and that comment still holds true. In fact, 'no-nonsense' and 'straight-ahead' are perfect terms with which to describe Francis Shergold, a man whose life has been intimately bound up in multiple aspects of the folk tradition. Although he dances very little these days, he is still often to be seen out in whites with his dancers, as he has been for over six decades. All sound clips are from the Veteran Tapes cassette Greeny Up (VT111) - see Links.